Tucked into a box canyon surrounded by some of the state’s highest peaks, Telluride is the stuff of legend. Stunning natural beauty and Victorian charm blend to deliver a ski town that makes an incomparable winter destination, and will leave visitors yearning to return and experience even more. 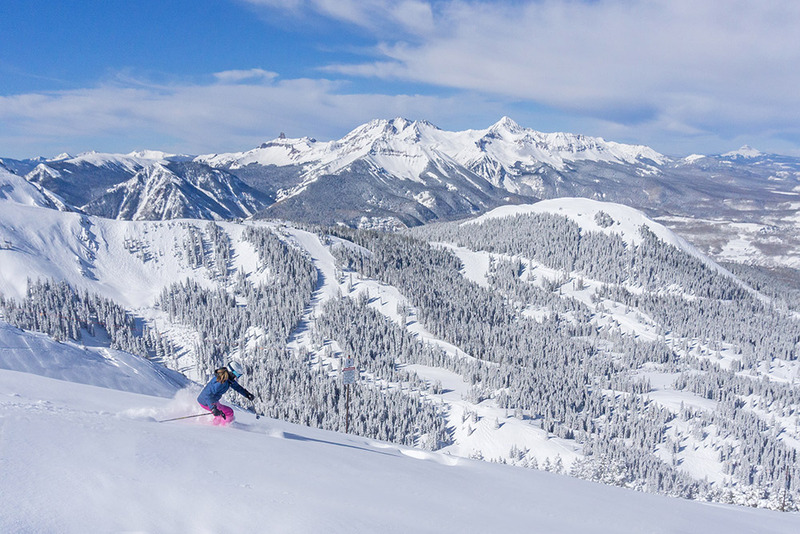 Here are five reasons to put Telluride at the top of your winter getaway list. 1. Access by air makes it easier than ever to get here. While Telluride may seem off the beaten path, travelers can take advantage of nonstop service from 11 major hubs (including Atlanta, Newark, Chicago, Houston, Dallas, Denver, Phoenix, Los Angeles and San Francisco) to reach the Montrose Regional Airport, just a scenic 65-mile drive from Telluride. Another option is to fly directly into Telluride Regional Airport, with service through Boutique Air (and a codeshare option on United), or on a charter or private flight, putting you on the slopes in a mere 10 minutes. 2. Skiers and snowboarders revere the legendary terrain. Powder hounds would be hard-pressed to find a more perfect location to point their skis and boards toward. In fact, Condé Nast Traveler readers ranked Telluride the No. 1 Ski Resort in North America for three consecutive years. And that’s no surprise, given the excellent snow conditions — the region receives more than 300 inches of snow a year — and few crowds to contend with. Lift lines are virtually unheard of, and you can spread out over more than 2,000 skiable acres. 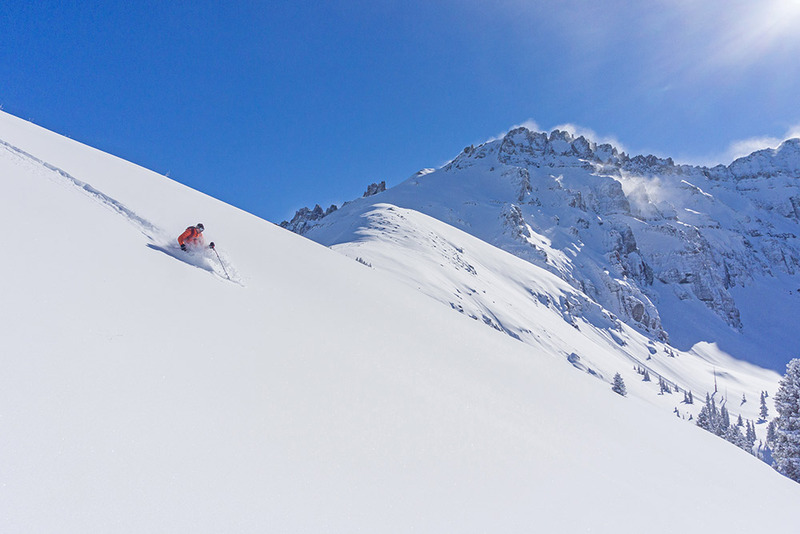 The vast terrain features a mix of beginner, intermediate and advanced areas, ensuring skiers and snowboarders of all abilities will find a wide range of runs to suit their comfort levels. More adventurous types should take advantage of unique hike-to terrain, which provides a backcountry experience while remaining in-bounds. Best of all, Stay & Ski packages starting at $155 per night are an ideal way to book your accommodations and lift tickets. 3. A wealth of exciting winter activities keep visitors of all ages entertained. Even if downhill skiing isn’t your main priority, there are plenty of other ways to bask in snowy delights. You’ll find six Nordic skiing areas in the vicinity, including Telluride Town Park, which offers equipment rentals. 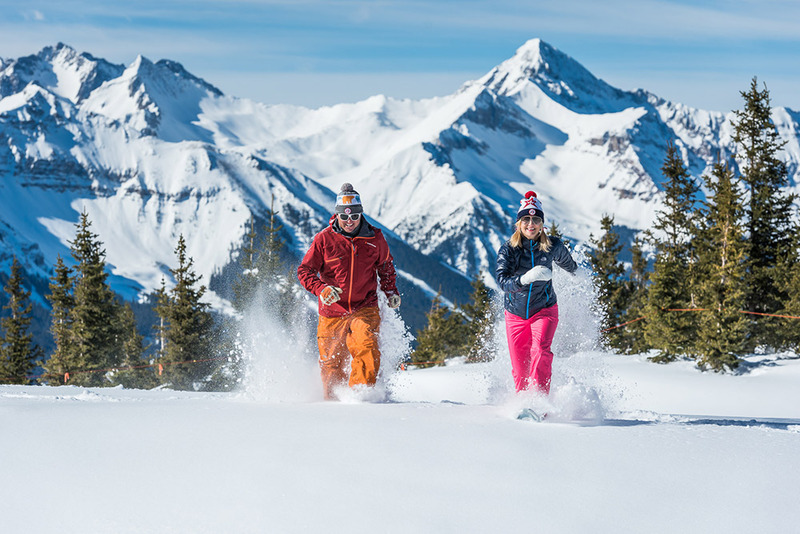 Whether you want to leisurely see the sights or get your cardio in during an uphill trek, designated snowshoe trails lead from Telluride and Mountain Village, plus guides from TopATen Snowshoe & Nordic Area can take you on a nature snowshoe hike. 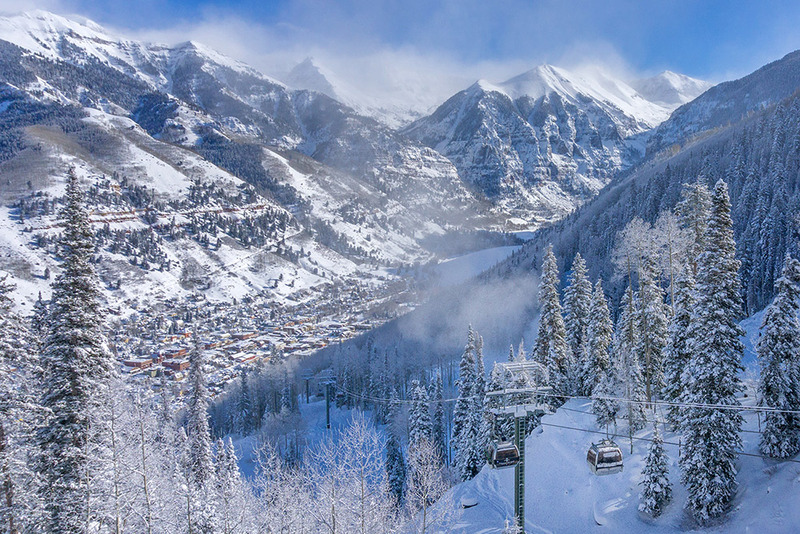 For a change of pace, twirl on the ice-skating rinks at Telluride Town Park or Hotel Madeline in Mountain Village, get your thrills sledding down Firecracker Hill or zoom over landscapes blanketed in white on a snowmobile ride; an extensive network of groomed trails awaits just beyond town limits. Looking for a unique jaunt? 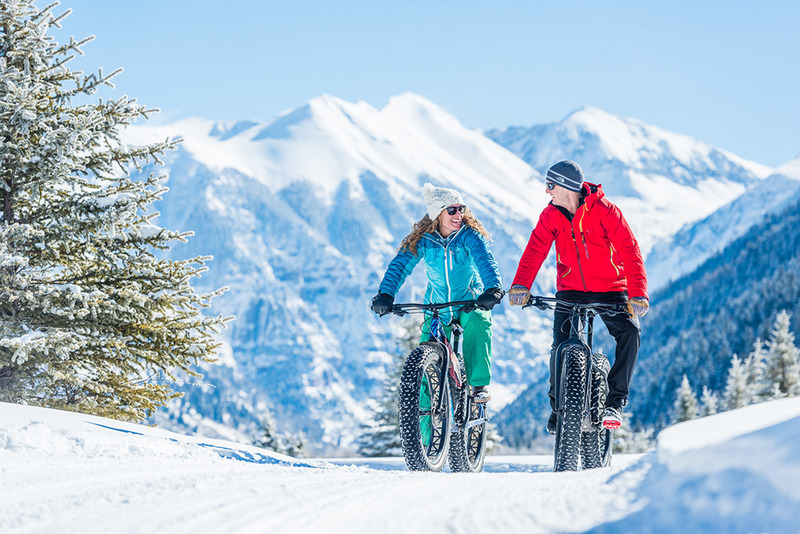 A sleigh ride under the stars makes for a magical experience, while Bootdoctors’ Bike & Bevies tour introduces the fat-tire biking phenomenon through a tour across the Valley Floor, ending with tastings at Telluride Distilling Company and Telluride Brewing Company. Or, take a day off to cast a line in one of the area’s streams and rivers. Winter is not only a prosperous time for fly-fishing on the San Miguel and Uncompahgre rivers, but also especially beautiful. 4. Telluride and Mountain Village boast an endless array of amenities. Perched above the Victorian-era enclave is Mountain Village, offering a modern, European-style foil to the Wild West character below. A free gondola — the first of its kind in the U.S. — has connected the pair for two decades, celebrating its 20th anniversary in December 2016. Between these aerial ferries, a pedestrian-friendly layout, excellent public transportation and shuttle service, there’s really no need for a car here. Finding somewhere to rest your head at night also couldn’t be more convenient. Accommodations range from Telluride’s classic hotels and contemporary condominiums to the slope-side lodges of Mountain Village. Whether you’re seeking specific features, need space for a group, are budget-conscious or want to bask in luxury, there’s a perfect place to stay. Pampering comes easy with a trip to one of several spas and salons, or rejuvenate through healing arts like yoga, Reiki and more. Another way to spend an off-the-slopes afternoon is shopping the plentiful boutiques and galleries — in fact, there are no chain shops or restaurants in Telluride. Speaking of restaurants, celebrated dining and nightlife options abound. 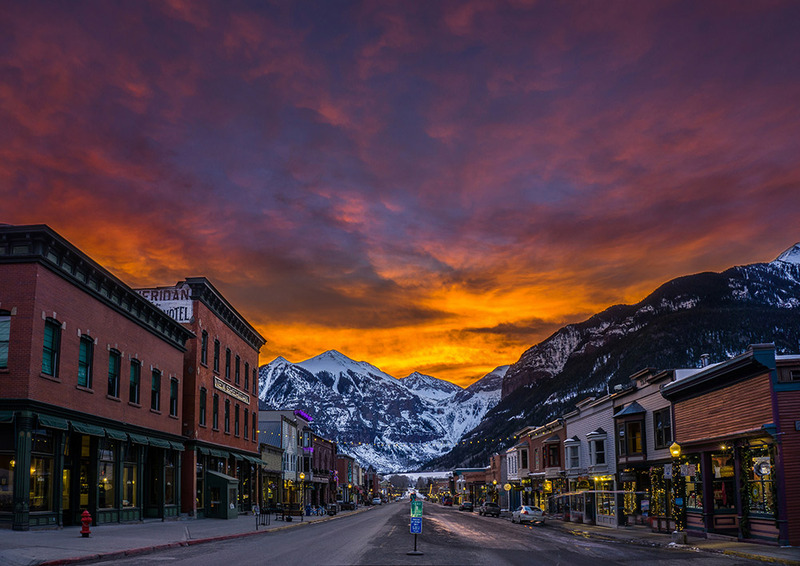 Condé Nast named Telluride one of the Top 20 American Cities for Foodies, so be prepared to work up an appetite for everything from casual pizzerias to on-mountain French and Italian eateries that guests can ski to. Once the sun goes down, pop into a saloon, enjoy live music or cozy up in a wine bar. 5. You’ll be inspired to return in the summer and explore in a whole new way. The snow may beckon you to Telluride initially, but to miss out on this gorgeous corner of Colorado in the summer would truly be a shame. The possibilities for outdoor pursuits are endless: camping in the San Juan Mountains; water sports including stand-up paddleboarding, rafting, kayaking and tubing; exhilarating rock-climbing routes and a via ferrata; and numerous trails for hiking and biking, including the popular path to Bridal Veil Falls. Not to mention the chance to hit the ball farther than ever at Telluride Golf Course, take in stunning scenery during a paragliding session or attend signature events like the Telluride Bluegrass Festival, Telluride Film Festival and Telluride Blues & Brews. Book your trip, plan day trips, find activities for kids or check out the latest virtual visitor guide.